The 50th anniversary of “Bloody Sunday” with events in Selma, Alabama that drew tens of thousands from around the nation provided lessons for students and journalism and mass communication faculty alike. Students from Roy Park School of Communications at Ithaca College arrived several days before the 50th anniversary to produce stories from the Selma community. SELMA, Ala– On multiple levels, the 50th Anniversary of “Bloody Sunday” presented a gold mine of opportunities for those of us who teach journalism and mass communication. Hats off to my faculty colleagues at the University of Alabama and elsewhere who spent many months planning reporting projects around this weekend’s Bridge Crossing Jubilee that brought President Obama and the first family along with members of Congress and the national media here to Selma. I was absolutely thrilled that my former graduate school classmate Dr. James Rada of Ithaca College and his students from the Park School of Communications appeared in the credits of NBC Nightly News last night as they reported on events in Selma for the nation’s most-watched network evening newscast. Closer to home, University of Alabama journalism students have been reporting for weeks on communities in Dallas County. Another team of students working with UA Journalism Professor Chip Brantley and Telecommunication and Film Professor Andrew Grace produced a documentary “A Call from Selma” on how the murder of a white minister in Selma was a catalyst in the Civil Rights Movement. The Digital Media Workshop course gave journalism students a chance to take their multimedia reporting skills to a whole different level. While these were all planned, multi-day team projects, what I saw today involved little planning other than students deciding to get a bus with the intention of learning something in a place they’d never really visited. A smartphone, a digital camera and maybe a pad (Although many of them didn’t have one of those– scary for me, as a traditional journalist) was all they carried along with them. I was only planning to be on the bus tour as a faculty facilitator. Low and behold, I had public relations and journalism students and some journalism and communication minors roaming the streets of downtown Selma taking it all in. 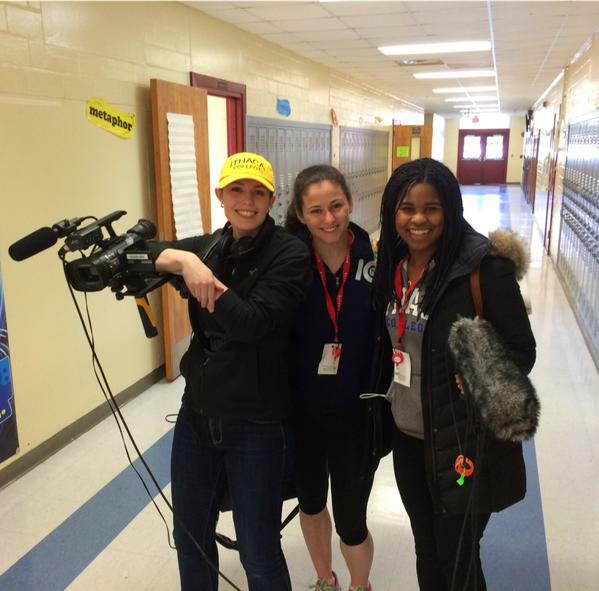 While we had viewed and discussed the PBS documentary, “Bridge to Freedom,” this morning, I had no idea what they would do when presented with the opportunity to do journalism and be more than a visitor to a festival or large-scale event. As we started today’s bus trip, I didn’t realize that the team of UA journalism students live-tweeting for The Tuscaloosa News with the hashtag #TuscSelma50 all weekend were on my bus traveling from our Tuscaloosa campus to Selma. One of the students, Alessandra Delrose, had been in my multi-platform reporting class. She was tasked with helping to write a story even as she live-tweeted the events. I got a chance to see her gathering interviews and photos and video, the very skills we teach in our journalism classes. No classroom assignment could ever replicate this kin d of event– with crowds swelling to 80,000 and a lot of things changing minute-by-minute. 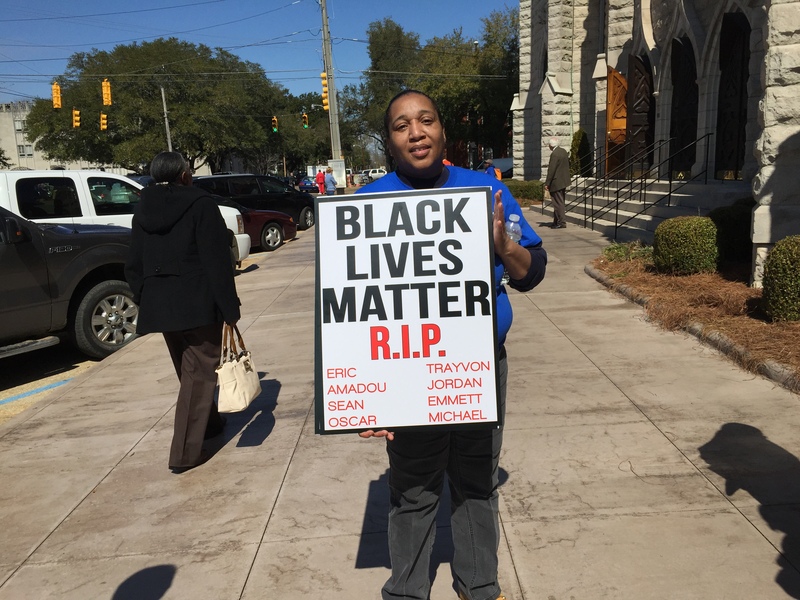 In the midst of a throng of Bridge Crossing visitors, our students were watching a church service from Brown Chapel AME Church that turned into a Pre-March Rally as speaker after speaker talked about the events at the Edmund Pettus Bridge long before Rev. Al Sharpton got up to deliver the morning message. One white student admitted having never attended a predominantly black church service before and yet realizing the public relations strategies that were being used by some who got up to speak. And, yes, as a diversity instructor, I think it’s relevant and appropriate to mention the ethnic backgrounds of the students in this case. Another Asian student was furiously taking down notes and whispering questions to me about the speakers as the event went on and hundreds gathered on Dallas Avenue behind us. She was not aware of some of the players from civil rights history in America. Some students struggled to figure out ‘do I listen and take quotes and take photos or both?’ How do I balance the two? Ah, the dilemma so many of us have faced in this era of social media, multimedia and traditional journalism rolled into one. Reginald Allen, a senior journalism major, did live tweeting and reporting from the events at the Edmund Pettus Bridge Sunday. 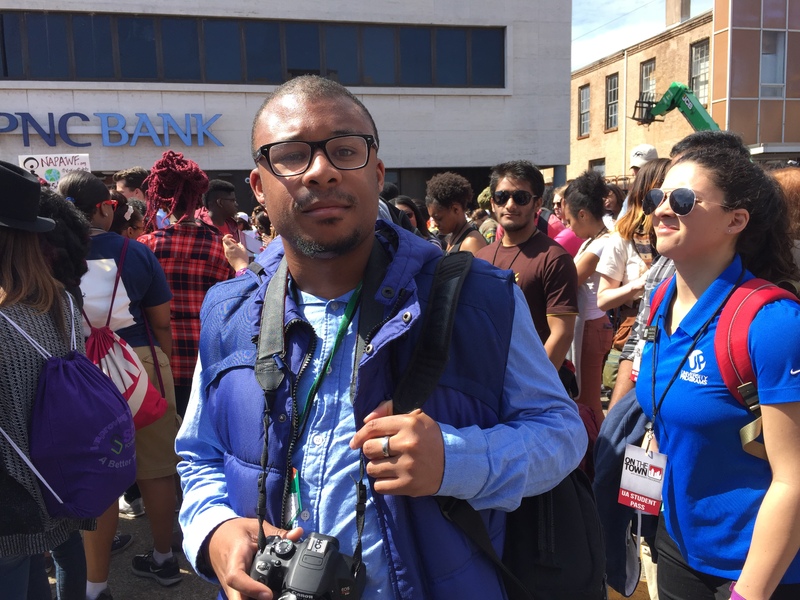 Ray Allen, a senior journalism student was working the crowds before and after they crossed the Edmund Pettus Bridge snapping photos and working on multiple news pieces at a time. This is the same student, who a few months ago would say very little in class. He would admit today that this was a new experience for him. But, he rose to the occasion like a champion! I couldn’t have been more proud. Allen and Delrose are just two examples of students who gained more experience in doing journalism and mass communication TODAY than they did all semester completing assignments and projects in my class. They both showed up and showed out in a big way, demonstrating the multi-platform reporting skills that are so important in today’s newsrooms. 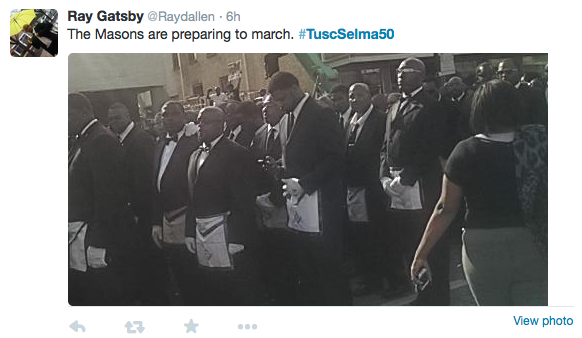 But, the events in Selma today and this past week were not just about learning journalism. The lessons about politics, the Voting Rights Act of 1965 and recent Supreme Court rulers that change parts of the Act, poverty and race were endless. What we’re doing today is offering students a lesson about social justice and that transcends their major, school or college affiliation. It’s up to us educators to utilize gold opportunities like to be unconventional in the strategies we use to facilitate learning. moments are often more likely to come when you as a faculty member take weeks or even months to build relationships that can result in great long-term projects. The New York Times’ mini-documentary was not a spare-of-the-moment “go cover this” decision. funded by University of Alabama to see how many mass media majors were going. Even if I had, I couldn’t have orchestrated today lesson. I have to be ready to look for the teachable moments in the unexpected and the uncertain. Lesson #4 De-brief, De-brief I found myself doing a lot of checking in with the students along the way. It was great to kind of be in that quasi-producer, news manager, media manager role at the scene of a breaking story like the one today. Lesson #5 Be Ready for Questions You Can’t Answer Today’s 50th anniversary celebration was filled with opportunities to teach history. I am NOT a historian. But, media history inevitably gets integrated into my lessons. As much I had learned from reading about Selma, the 1965 Voting Rights Act and that era, there were several questions students asked today that I couldn’t answer. It’s ok for us Ph.D.s to not be experts in everything, even though journalists like be well-rounded, widely read individuals. The lessons in the signs and t-shirts worn by attendees were endless. 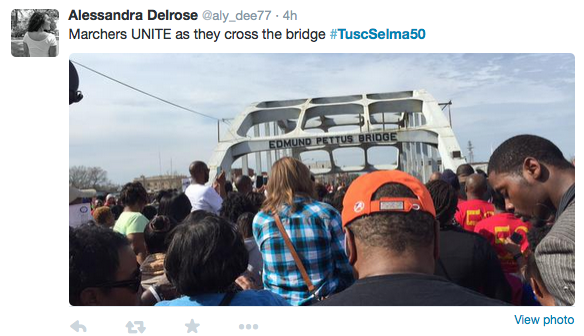 I think this day and this past week Selma became the BEST JOURNALISM and MASS COMMUNICATION Classroom in America!